We have been fortunate to have Niklas Heine visit our lab from the University of Münster, where he is working on a PhD degree in the laboratory of Armido Studer. Niklas has brought with him a lot of expertise in radical reactions. These sorts of visits are great for my students as they encourage us to try things we have wanted to attempt for a while, but have encountered high barriers due to lack of familiarity with certain kinds of techniques. Those of you who follow my posts know that this is a general frustration of mine – I refer to convincing students to use methods that are less common than all those round bottom flask getups. For many years we have not done any electrochemistry, which I absolutely love. My lab published a lot in that area thanks to Tung Siu, who ran anodic oxidation experiments 15 years ago. He came to us with electrical engineering background, which is why electrosynthesis was a natural fit for him. Thus, I am not really laying any blame on others who might not have viewed the use of wires with the same level of enthusiasm. I even had a company, Ylektra, who pioneered parallel electrosynthesis (Tung worked there for a while). Ylektra was the wholly owned subsidiary of Affinium Pharmaceuticals, which was in turn acquired by the Swiss company Debiopharm last year… So there is a lot of good stories ultimately rooted in electrons! The lost art of Norrish type II reactions is the scientific part of today’s post. Below is a fantastic example of its use in total synthesis by Leo Paquette. The ketone you see was taken up in dioxane and placed in a Pyrex tube. The resulting solution was deoxygenated, and then irradiated using a medium pressure Hanovia lamp for 10 h. The process was run on a 100mg scale and delivered a 62% yield (not bad!). As with many photochemical reactions, the reaction was fairly dilute (10mL of dioxane was used). Still though, this a great example of C-H activation… Isn’t it? Of course it is. Here is a pleasant surprise. For the life of me, I cannot believe that this has never been tried before. The venerable Passerini reaction, one of the cornerstones of multicomponent reactivity, hinges upon the union of a carboxylic acid, an isocyanide, and an aldehyde. Now Soeta and Ukaji are telling us that sulfinic acids are also competent participants in this process. While the report triggers that classic response “Why didn’t I try this?”, finding the right sulfur-containing participant was probably not that straightforward. After all, readily accessable and infinitely more stable sulfonic acids would have probably been the first choice. Alas, the stars in the pKa universe are not aligned in that case and the reaction does not work (Or does it? Maybe someone should give another kick in that can!). The good news is that synthetically meaningful sulfonates in the Soeta/Ukaji method can be generated through in situ oxidation, giving rise to substrates that undergo straightforward nucleophilic displacement reactions. This chemistry is nicely set up for a lot of divergent possibilities and lends itself really well to library synthesis. As far as the mechanism – the “sulfono-version” of the familiar acyl transfer is taking place here. Still, with all the effort spent in the area of multicomponent reactivity I am somewhat puzzled by this report that just appeared two weeks ago… But then again – this only underscores the notion that the most obvious things have not been attempted. This is the golden rule of research in my view (and a rather ironic one). Earlier today, we had the first of a series of joint symposia between the University of Toronto and the University of Münster. Apart from MIT’s Mo Movassaghi (who gave a great lecture on his ongoing studies of alkaloid total synthesis), the speakers in the line-up were from Toronto and Münster. I thoroughly enjoyed the talks by the students as well as those by my colleague Mark Taylor and by Frank Glorious from Münster. Frank and I discussed the following point I was trying to make. You see, I think there is a temptation to present some of the state of the art in the bustling area of transition metal-catalyzed C-H activation as breakthroughs that now allow one to carry out reactions at significantly lower temperatures than before. In general, mild reaction conditions run counter to what we have learned to expect from this field. Transformations, while often elegant and enabling, typically require a lot in terms of activation energy. As we all know, it is common to see temperatures well above 100 oC prescribed in C-H activation protocols. However, some of the processes that recently appeared from the labs of Cramer, Glorius, and others, suggest that significantly lower temperatures can now effect the desired transformations. This sounds really good and appears to formally represent a significant improvement. Having said that, should we be so enthusiastic? 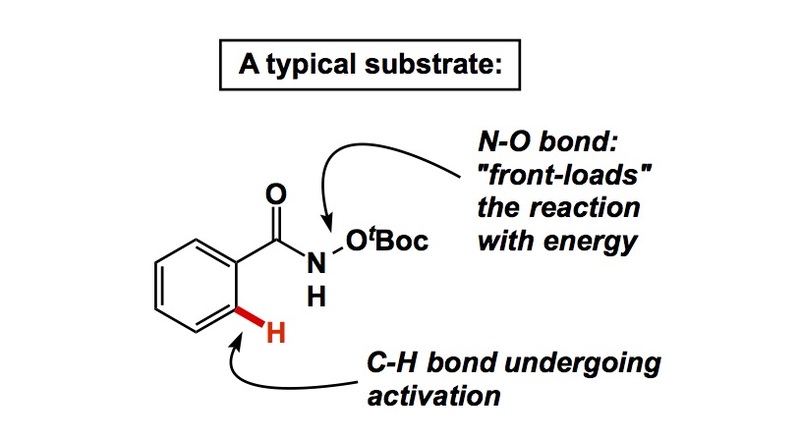 If you consider the aforementioned studies, you will often note a common theme: a heteroatom-heteroatom bond as part of the substrate. The appearance of a lower temperature at which such substrates are activated is due to what I would call “energy front-loading”. I am showing a representative molecule that is commonly seen in these reports. It is perhaps not a surprise that an N-O containing substrate would require less activation energy than some other molecule. This is purely thermodynamic in nature: it all amounts to a clever redistribution of energy that gives us an illusion that the overall process is milder. Don’t get me wrong – the reaction conditions are relatively mild – but it is because you “front-load” the starting material with energy. I will make the following analogy: should we be touting epoxide ring-opening reactions as amazingly mild Sn2 processes? Epoxide ring-openings do appear to require less activation than other, strain-free, reactions with ordinary leaving groups, but they benefit from the energy embedded in 3-membered scaffolds. I would be very impressed if someone came up with a ligand system to channel a relatively energy-costly metal catalyzed reaction into a more reasonable regime. This is very different from front-loading substrates with energy, but does this option even exist? After all, there is no free lunch and there is always a need to get energy from somewhere. We had a nice discussion with Frank. I think there are many interesting challenges that lie ahead in the field of C-H activation, yet I have my doubts that truly relevant energy barriers in this field will be coming down any time soon. These reactions seem to need special tricks to appear mild. For a number of years now, those who have acknowledged challenges associated with high barriers in this area, have been implying that solutions in the form of ligands might be in store. I have not seen these but, as George Olah would say, please forgive my ignorance. Do let me know if you have encountered such studies. OK, so this is a fairly esoteric example and you might wonder why I am bringing this up. I suppose it is because I find it interesting to look at stuff that is unusual and lies outside the beaten track. I have always loved such science and I always will. 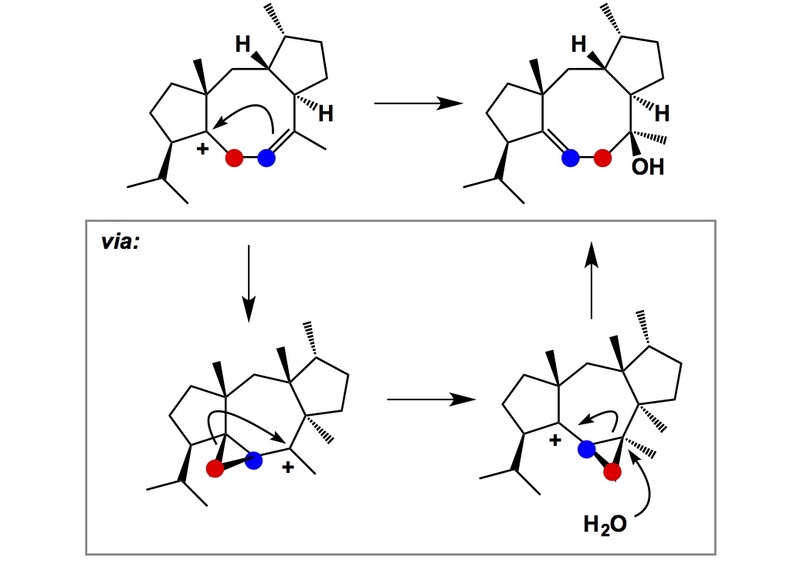 When I visited Purdue University last Fall, Prof. Mingjie Dai shared with me some innovative and highly divergent synthesis of alkaloids that was inspired by their possible biosynthesis. 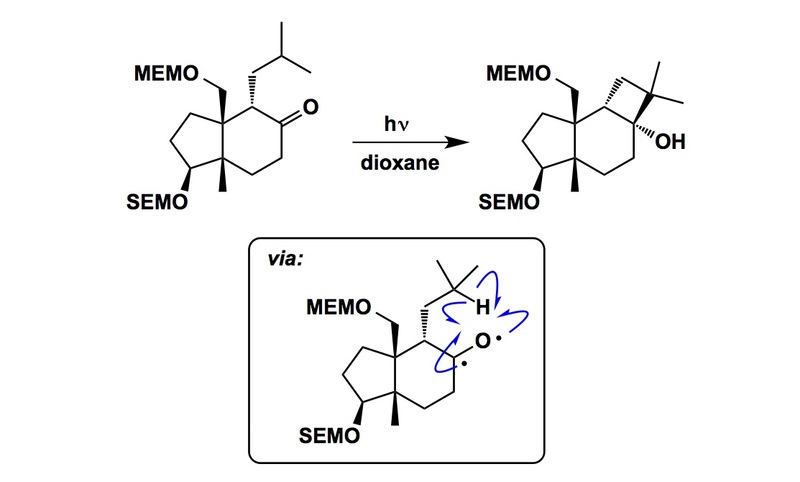 At that time the work was not yet published, but now that it is, I want to draw your attention to a cool application of the Witkop-Winterfeldt oxidative indole cleavage. Upon C=C bond scission, transannular collapse leads to the formation of the cyclol structure shown below. This transformation is followed by azide-to-imine transformation mediated by triphenylphospine. 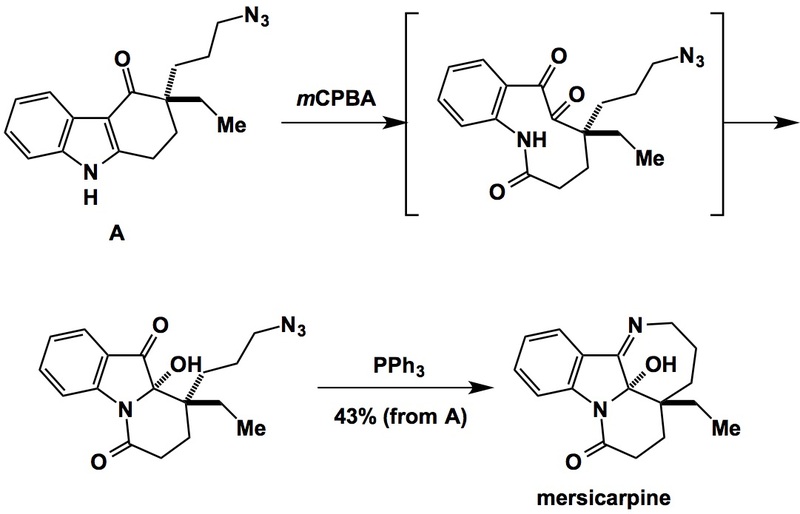 The paper describes the synthesis of several indole alkaloids, of which I am only showing the molecule of mersicarpine. If you read the manuscript carefully, you will marvel at the application of the functional group pairing in order to arrive at some really intricate structures from a common starting material. It is too bad that I already gave my cumulative exam last week…. Thanks to Dr. Yusheng Xiong, I had a very informative visit to Merck in Kenilworth (New Jersey) this past Friday. The location of this site is very close to Rahway, which used to be Merck’s primary medicinal chemistry center. Since the acquisition of Schering-Plough several years ago, Kenilworth has been steadily turning into the main discovery hub for Merck. While I can’t describe the proprietary details I learned during this trip, I can make several general statements that define the overall visit. When compared to the days past, there is clearly a new approach to drug discovery at Merck. This company used to be very much a small molecule-driven operation. It is now more about “whichever modality fits the target in question”. This is the main reason why there is so much interest in macrocycles, which was one of the topics covered in my lecture. My second point is more scientific. Throughout the day, I had several discussions that involved some stereoelectronic arguments. While I cannot talk about them, I think I can mention a paper that just came out in J. Med. Chem. It describes the role of divalent sulfur in the structures of therapeutic agents and provides an excellent demonstration of intramolecular oxygen-sulfur interactions. Take a close look at the two structures below. 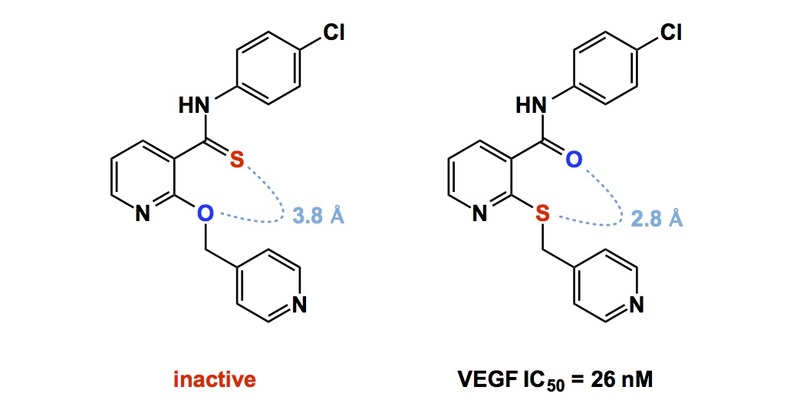 There is no way (in my view) of guessing which one of these two extremely similar compounds is more effective in inhibiting VEGF. Interestingly, one of them is potent, whereas the other is completely inactive. People are just beginning to fully appreciate the involvement of sigma hole-driven interactions and, in the example below, conformational stabilization is evidenced in the shorter through-space O-S distance in the active molecule compared to the “dud”. Tonight I am not covering anything from the recent literature. My post is very much need-driven, rather than current literature-based. My lab has contemplated ways of putting together alpha-substituted proline derivatives. Our long-standing plan is to use them in a range of reactions, including our peptide macrocyclization. While you can buy the alpha-methyl variant, good luck finding something that is a bit more elaborate. In this regard, you might say that there has to be a way to use sigmatropic reactions and induce transfer of a nitrogen-bound group to the alpha carbon. Something like this rings a bell and formally corresponds to the Stevens rearrangement. 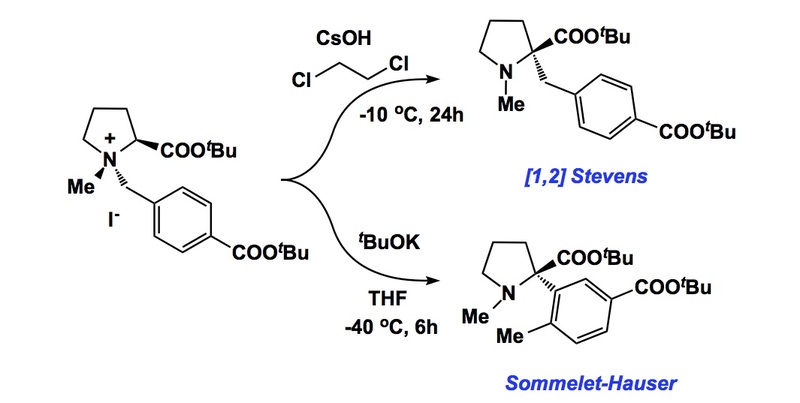 The trouble is, this process is never clean due to the competing Sommelet-Hauser rearrangement. By the way, there is nothing wrong with this “competition” because the Sommelet-Hauser process is equally attractive from the endpoint perspective. However, the rule of reciprocity tells us that, in this case, the product will be contaminated by the amino acid derivative emanating from the Sommelet rearrangement. There is a delightful Angewandte paper by Tayama and co-workers that shows how control can in fact be exercised. Take a look. I definitely want to use some of these amino acid building blocks in our chemistry. There is something really interesting about potassium tert-butoxide (I’ve also heard that if you have a bottle of this stuff, you do not need any transition metal catalysts anymore… I refer to that curious Grubbs/Stoltz paper, of course).